"Plump" is not usually a word women like to hear. When we're all consistently dieting, working out, stressing about how many calories were in last night's martini, and worrying whether our new pants make us look fat, we're seriously all hoping and praying no one around us is even thinking the word "plump." But there is one case in which this word is allowed to come into play. When, pray tell? Why, when we're trying to plump up our lips, of course! There are tons of lip-plumping glosses and lipsticks on the market, all claiming to be the best of the best. And most of them do the trick quite adequately, it's true. But this beauty chick has found what she believes to really be the best of the best -- and that would be the DuWop Mini Venom Trio. 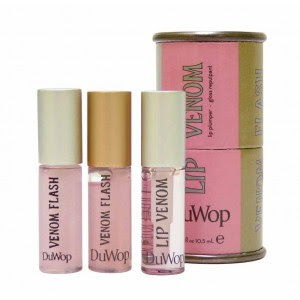 Held within an adorably-sized tin are your three new best friends -- miniature sizes of the line's already popular Lip Venom (faintly pink gloss) Venom Flash Gold (speckled with gold shimmer) and Venom Flash Silver (flecked with silver shimmer). Sweep it on and feel the tingly sensation in your lips that could only mean the gloss is working its magic -- and after a few minutes, they will seriously have plumped up just enough to give you the most amazing mouth for miles around. The DuWop Mini Venom Trio retails for $19 at beauty.com.